Keep burglars and thieves from getting access into your company with our commercial door repair and locksmith service. We offer many products for you to choose from and install and repair all of our products at your convenience. Don’t get locked out of your home or car anymore. Our residential and automotive locksmith has many accessories to keep you organized and can replace or copy any keys you need. and how you can protect your business. Hours of Operation: Monday – Friday, 8:00 a.m. – 5:00 p.m. | Saturday, 8:00 a.m. – 1:00 p.m.
Our locksmith company in Mustang, Oklahoma, keeps your business, home, and vehicle safe with our large variety of security locks and products. We've been in Mustang since 1980, serving the metroplex area of Oklahoma City, Oklahoma. We are a family-owned-and-operated company with one owner since the inception. 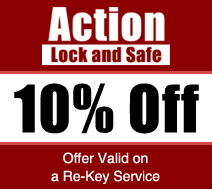 Our locksmith company has superior professional services that provide quality installation and repair services without causing damage to your property.